Are Selfies Driving Plastic Surgery? For the past few months the media has been twittering and gasping about the explosion of patients seeking plastic surgery... to look better for their selfies. Yes, selfies. 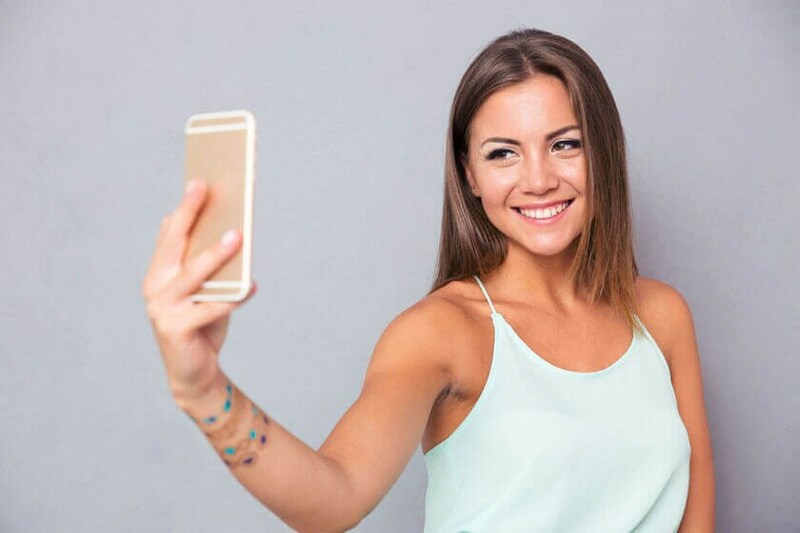 According to the International Business Times(1), “the selfies that dominate Facebook, Twitter and Instagram profiles have created demand for new procedures and are specific to the needs of younger clients." The Daily Mail(2) reports that “one in three surgeons” has noticed an increase in the number of patients “wanting the perfect selfie,” leading to more rhinoplasties and eyelid lifts. Patients feel pressure “to improve their profile on social media sites.” If you’ve ever taken a self-portrait with a smartphone, surely you can understand. Haven’t you captured your image at a bad angle in poor lighting with an odd expression? As you stared at your image, noticing maybe your nose is too big or your eyelids too heavy, what was your first reaction? Call a plastic surgeon! Right? Wait, WHAT? Did you say NO? You’d trash the photo and retake it with a better expression? Mmm hmm, good point. You could do that. And I guess you could turn your head to a more flattering angle. Or find better lighting. Or take a photo of your cat instead. Those are all good ideas. But wouldn’t you consider for just a tiny moment calling a plastic surgeon? Actually, you probably wouldn’t. You know the study at the center of the media frenzy? It’s not all it was cracked up to be. After Fast Company’s Chris Gayamali(3) looked into the details, he found the survey of 2700 surgeons was actually performed by a PR firm, not a physicians’ group or a medical society. OK, so maybe that doesn’t matter, but the response rate does, which was less than 5%. And that selfie question? Only 69 surgeons (less than 3%) answered. (4) So what about selfies? Are they poison to self-esteem, especially for the young and vulnerable? Quite the opposite. According to a study by Today.com(5), 65% of the teenage girls who responded found “ selfies on social media actually boosts their self-confidence.” Think about it. The subject is also the photographer. That gives her a movie star’s power to approve or reject what’s released to the public. But selfies on social media don’t make everyone feel good. According to the Today study, the thing that can make people feel bad about themselves is seeing “glamorous, mostly happy pictures of other people’s lives.” So if you know a teenage girl, tell her that those celebrity-like photos are often as controlled and contrived as a movie set, and while selfies may look perfect, real lives aren’t. As far as our own social media presence, since this selfie tempest in a media teapot is really more of a brilliant PR stunt than a scientific study, I think we’re safe to keep mugging in front of our smartphones. How many of our own patients want plastic surgery so they can look better in selfies? Zero. No one. Not a single one. Frankly, if selfie-disappointment were truly a patient's chief complaint, as a plastic surgeon I'd advise choosing another photo angle. Before believing (and sharing) the results of a shocking new study, pay attention to who conducted it, what the real numbers are, and how they might have been manipulated. Happy posting!